A clay mineral of extremely small particle size and high plasticity. Raw bentonite is generally a pale green, buff, cream, or grey material composed of the clay mineral montmorillonite. It is used to plasticize clay and porcelain bodies, often used in amounts of 1-5%. Its origin can be traced to ancient volcanic eruptions where fine volcanic ash particles were carried by winds and deposited in discrete layers which altered over time from the glassy state to claystone. 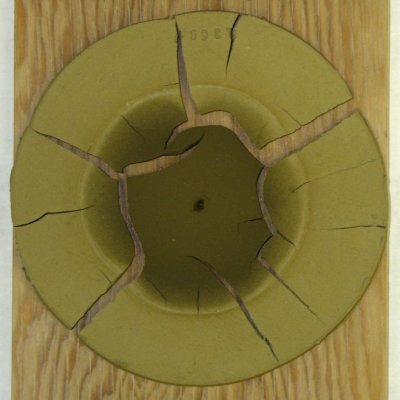 In North America, bentonites are mined in Montana, Wyoming, South Dakota and Saskatchewan and used in things like porcelain, toothpaste, tablets, cosmetics, oil drilling mud, oven cleaners, insecticides, putty, paint, ink, paper, polishes, cleansing agents, explosives, detergents, plastics and rubber. 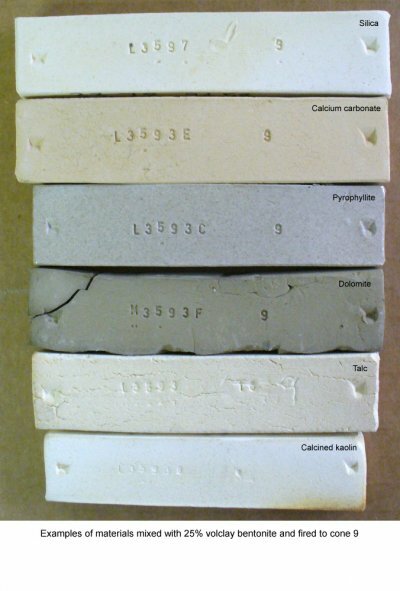 Example of various materials mixed 75:25 with volclay 325 bentonite and fired to cone 9. Plasticities and diring shrinkages vary widely. Materials normally acting as fluxes (like dolomite, talc, calcium carbonate) are refractory here because they are fired in the absence of materials they react normally with. This disk has dried under heat (with the center part protected) for many hours. During that process it curled upward badly (flattening back out later). It is very reluctant to give up its water in the central protected section. Obviously it shrinks alot during drying and forms a network of cracks. When there are this many cracks it is difficult to characterize it, so a picture is best. A few drops of water on top of a tiny pile of bentonite powder. Notice the water just sits there in a little lake. It does not soak in because the bentonite gels in contact with the water and that gel acts as a barrier. 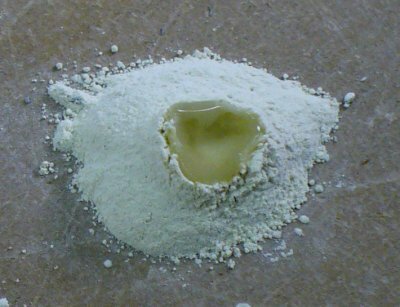 This water-barrier property of bentonite is a key to its use in many products but can be a problem in ceramics (because it slows down the drying speed of bodies and glazes that contain it).